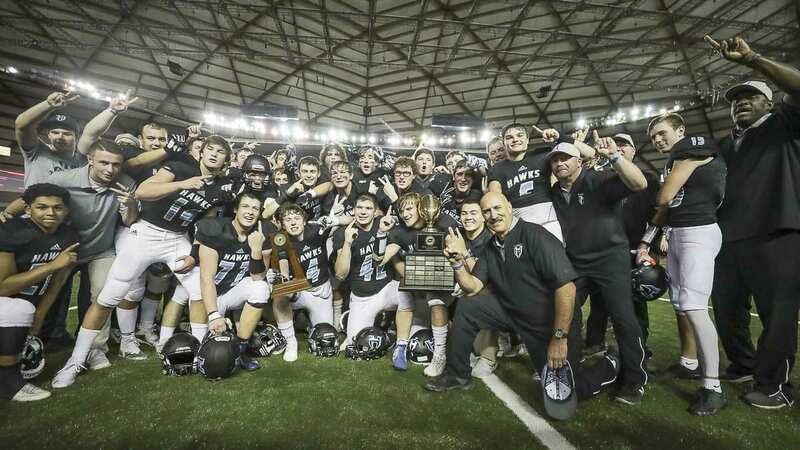 The Hockinson Hawks made history Saturday night, becoming the first football program from Clark County to win back-to-back state championships. It is Hockinson’s own history, though, that paved the way for this incredible journey. There was the inauspicious start to the program, that first dreadful season. The Hawks improved, but there would be constant disappointment in Week 10, year after year. There was the unexpected change of leadership when the head coach had to leave. That coach would make a triumphant return a year later, but that almost did not happen. Then there was the key victory that led the Hawks on this road to dominance. Remember the day: Nov. 7, 2014. That is when the Hockinson Hawks figured out how to win when it mattered. 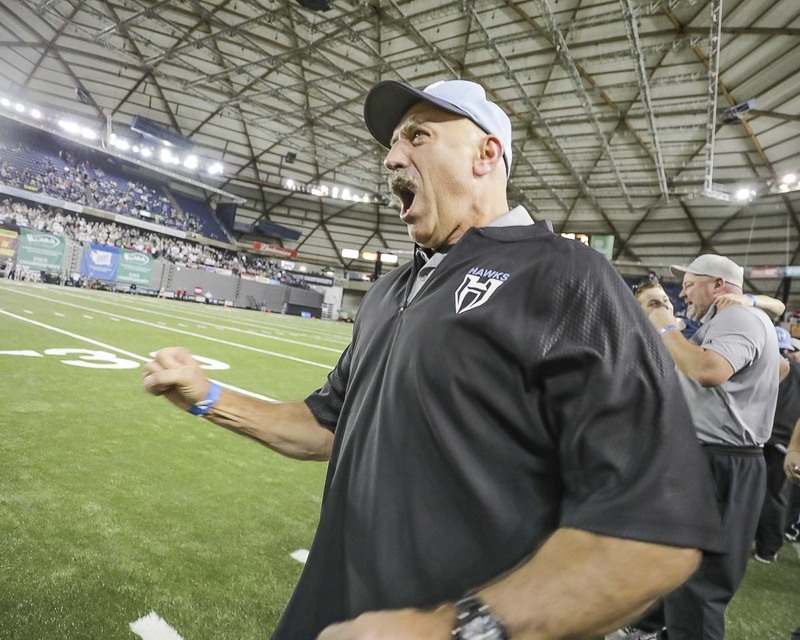 Hockinson coach Rick Steele has been the team’s coach for all but one season. He built the program. He endured through the tough times. Now, he and the Hawks sit atop the Class 2A world in Washington, having the longest winning streak — 27 games — in the state in all classifications. He said he could never have imagined this back in 2004, when his Hawks went 0-7 and scored a total of 29 points. The Hawks quickly learned there is no mercy at the varsity level. Steele and his coaches did lay a foundation for what continues today. It is all about positive reinforcement with the Hawks. “We told them after every game, ‘We’re proud of you. You guys aren’t quitting.’ I’ve talked to some of those older players. They said those talks are what kept them going,” Steele said. When it came to coming back the next season, though, not everyone returned. Hockinson had a new high school at the time. For the second football season, there was an entire new class coming to campus. The number of football players did not grow, though. Steele remembers the first two weeks of that second season. In Week 1, the Hawks took a late lead on a safety. But on the ensuing free kick, the opponent punted the ball, and those on the return team allowed the ball to drop to the ground, thinking punt rules applied. Instead, it was kickoff rules. That ball was live. Ilwaco recovered the ball, then scored the game-winning touchdown. “They were just crushed,” Steele said. After getting blown out every week the previous year, the Hawks felt they gave away a victory. More positive coaching followed, and the Hawks were ready to play in Week 2. Once again, they had a late lead. Steilacoom was driving for the tying touchdown, there was a long scramble by the quarterback and a throw into the end zone. Max Schantz got the interception for Hockinson, Steele said. “It was just mayhem,” the coach said. A year later, the Hawks won the Class 2A Greater St. Helens League title and made the playoffs. They would lose in the mud at home that night. It was the first of many Week 10 frustrations. Starting with that 2006 season, the Hawks qualified for the district crossover playoff in six of seven seasons — and lost all six games. Not one contest was even close. The Hawks could not win the big one. Then the Hawks lost a bigger one. Steele, a firefighter, had to step away from coaching when his schedule changed. The 2013 season was tough — on him and his former team. The Hawks would finish with a 5-4 record but did not qualify for the playoffs. The next year, his schedule allowed for Steele to return to coaching. However, there was no opening at Hockinson. “I was set to be on John Lambert’s staff at La Center,” Steele said. Before that become official, there was a change at Hockinson. The new coach was no longer the coach. It took about a half hour, Steele said, for his phone to ring. Oh yes, that history thing again. But first, the Hawks had to exorcise their own past. The Hawks went undefeated in the regular season in Steele’s first season back on the sideline. Of course, that just meant another Week 10 playoff game, another disappointment, right? And when Black Hills had a 21-0 lead in the fourth quarter of that game, no surprise, right? The day: Nov. 7, 2014. Told you to remember it, right? It’s important. Until everything changed with 12 perfect minutes for the Hockinson Hawks, who scored three touchdowns in a row and then kicked a field goal for a 24-21 victory. The Hawks made it to state for the first time, won in the first round to improve to 11-0 and lost in the quarterfinals. In 2015, another 11-0 start and a three-point loss in the quarterfinals. Hockinson lost in Week 10 in 2016, but that was a success, too. Since losing that district playoff game in 2016, the Hawks have gone 27-0 with two state championships. Oh, and the Hawks are now 56-5 since Steele returned. Steele is also proud to note that this is home-grown talent. His small school has not had the luxury of proven high school athletes moving into his district to shine on the field. He has noticed a change in the athletes who are playing football, though. “In my first era at Hockinson, I could not get the athletes to play football,” Steele said, noting he always had tough players but many of the best athletes on campus stayed away. “I battled the basketball coaches in that era. They would not let their players play football,” he said. Since his return, attitudes changed at Hockinson. The skill position players arrived. “That’s how this passing game took off. We started getting athletes, and we had the quarterbacks who could throw the football,” Steele said. Another key, Steele said, is Advanced Athlete Academy, or A3, by Brad Packer. The Hawks adopted Packer’s training philosophy. Steele noted that A3 training is also used by Union, the other Clark County football team that won a state championship last week. The players are stronger, more athletic. The coaching, through experience, is improved. That combination has led to this 27-game win streak for the Hockinson Hawks. Seven of the 11 starters on offense this season are juniors. Freshmen made key contributions in the championship game Saturday. The team got together Sunday morning for a final breakfast, to salute the 2018 Hawks. Already, Steele said, coaches were talking about 2019. 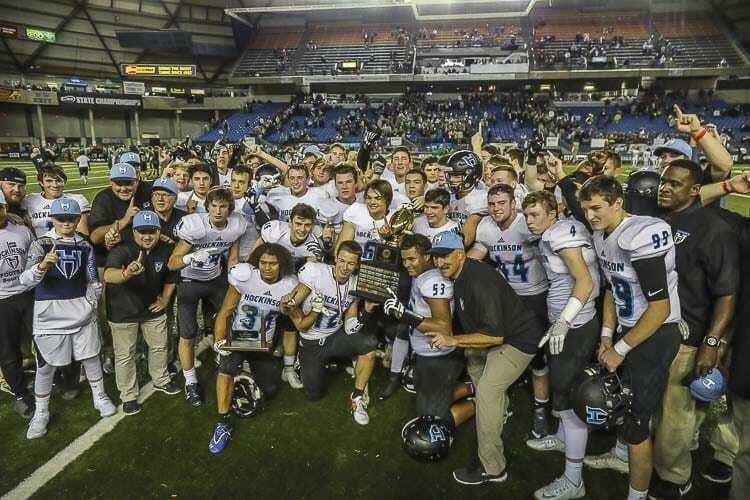 The Hockinson Hawks are on an historic run, and they have a lot of history to back this run.